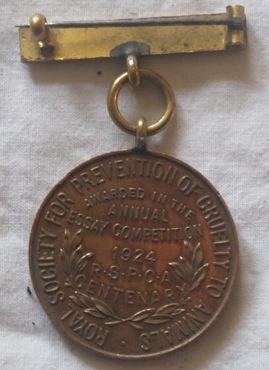 This medal was awarded for a winning entry in the 1924 Royal Society for the Prevention of Cruelty to Animals Essay Competition. The essay competitions sponsored by organizations like the RSPCA encouraged creative responses to questions and issues surrounding the humane treatment of animals. 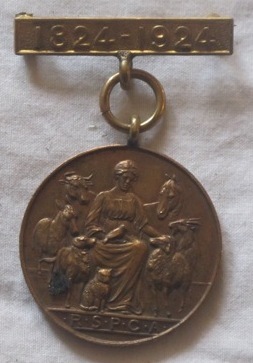 RSPCA Medal Awarded for 1924 Essay Competition, back. Collection of Scotlund Haisley.